By now, if you are a frequent visitor of TPC, you will know that I will occasionally pick up a textbook on project server/online & project management. 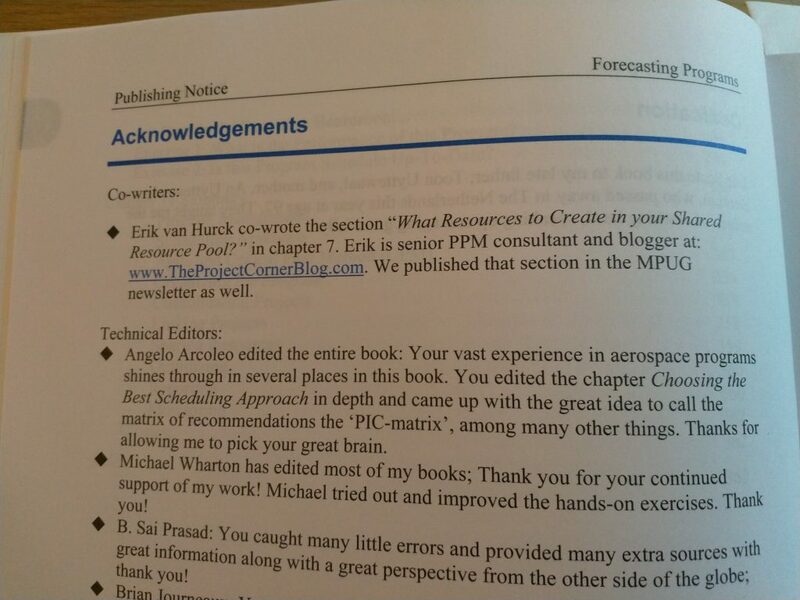 You might also recognize Eric Uyttewaals trademark when reading a title that starts with “Forecasting…”. This is another book review, and it’s a little bit special because I helped write one of the chapters! The title of the book: Forecasting Programs. The book contains 11 chapters, is 363 pages (excluding the index). It has a familiar design as Eric’s other “Forecasting” books. There are black and white pictures describing situations and every chapter starts with a nice visual and explanation about what to expect from the chapter. Also, Bob and Nob are back. These cartoon characters give a light scenario between a person that knows how to do Forecasting on Programs (Bob) and a person that clearly doesn’t (Nob). Forecasting Programs starts of by describing what a program actually is. As well as discussing the general need for a good scheduling application & practice. Eric uses Microsoft Project for most examples and will sometimes use the server/cloud version where needed. A good example of the use of Project Online is in chapter 7 Sharing Resources (the one I helped write). If you are a program manager (ergo: someone overseeing, together with project managers and their teams, multiple interlinked sub projects in order to provide the best possible outcome) you will gain valuable insight into creating a master schedule, maintaining a resource pool and tracking overall progress on the program. And there’s even a chapter on Agile in case you were wondering. Chapter two contains a very useful matrix Eric dubbed it the Project Ideal and Constraint matrix (PIC-Matrix). This matrix helps you find out what kind of scheduling methodology you should use. This is important to know because you probably already experienced that Agile or waterfall isn’t the best option for every schedule. Then, in chapter four there is great advice on organizing the program. Such as the max number of sub projects you should aim for in your program (15). In chapter 7 you’ll find the section that I helped write. And it’s related to resources. A subject close to my heart because it’s one of the core features that distinguishes MS Project over Excel. Where Microsoft Project is much more alligned with what is actually needed then Excel. Example: try moving a task with resources to another month and you will see you need to change all other tasks that are dependent as well as costs and hours separately in Excel. If you don’t, than there are a lot of macro’s in your Excel file . The last gem I wanted to share with you: in Forecast Programs you will learn useful ways to monitor and report on programs. The final two chapters are dedicated to this. And although I think it could contain much more depth, I love the way Eric incorporated the out of the box tools as well as third party additions. Eric Uyttewaal is a familiar name in the PPM world, he wrote multiple books on the subjects of dynamic and forecasting scheduling. Most of his books I’ve reviewed on TPC, you will be able to find them on the book reviews combination post. And of course here’s the link to the book on Amazon. Thanks for reading this review, let me know if you know another book (in regards to project and project management) you would like me to review by leaving me a comment below. And if you are looking for more about MS project, might I suggest looking into my YouTube channel? It’s pretty new at the moment but there’s more to come for sure!